At this event internationally renowned, bestselling thriller writers Wendy Corsi Staub and Alison Gaylin will discuss their new novels and entertain questions from the audience, followed by a book signing. With the upcoming release of her twenty-first thriller, The Perfect Stranger, New York Times bestselling suspense novelist Wendy Corsi Staub will have published more than eighty novels over the course of her distinguished career. 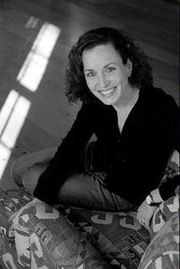 Wendy has twice (2011 and 2013) been nominated for the Simon and Schuster Mary Higgins Clark award and is the recipient of the RWA Rita Award, the RT Bookreviews Award for Career Achievement in Suspense, the RWA/NYC Golden Apple for Lifetime Achievement, four WLA Washington Irving Awards for Fiction, and numerous other honors. She has sold more than four million books worldwide.In the book one woman finds herself in the crosshairs of a twisted predator who might just be masked behind a familiar screen name . . .
USA Today and International best-selling author Alison Gaylin received an Edgar nomination for her first book HIDE YOUR EYES. Her Shamus Award-winning novel, AND SHE WAS, was also nominated for the RT award, the Thriller and Anthony awards. Stay With Me, her eighth book - and the third in the acclaimed Brenna Spector series - is out June 24, 2014 from HarperCollins. In the book, Brenna Spector is held prisoner by the past. She has perfect memory, which allows her to recall in vivid and remarkable detail every moment of every day of her adult life. If only she could remember more from her child-hood . . . for she's still trying to unravel the mystery of her sister Clea's disappearance twenty-eight years ago when Clea was seventeen. But now her obsession with finding out what happened to Clea is taking a toll on her own teenage daughter, Maya, who's been very secretive lately. And when Maya goes missing, Brenna fears her worst nightmare has come true. An afternoon of mystery and suspense! Come hear local author Alison Gaylin and Wendy Corsi Staub read from their new books. Gaylin's "Into the Dark' and Wendy Corsi Staub's latest, "Shadowkiller." will keep us on the edge of our seats! Alison Gaylin is the author of And She Was, the Edgar®-nominated thriller Hide Your Eyes, as well as its sequel, You Kill Me, and two stand-alone novels, Trashed and Heartless. A graduate of Northwestern University and Columbia University's Graduate School of Journalism, Alison lives with her husband and daughter in upstate New York. Wendy Corsi Staub is the award-winning author of more than seventy novels. She lives in the New York City suburbs with her husband of over twenty years and their two children. March 3, 6PM: Alison Gaylin's Latest Thriller, "And She Was"
We are super excited to be doing a thriller event with local author Alison Gaylin! Edgar® Award nominated author Alison Gaylin is rapidly becoming a major player in the thriller game. A breathtaking novel of suspense, Gaylin’s And She Was introduces a remarkable new protagonist: Brenna Spector, a missing persons investigator afflicted with Hyperthymestic Syndrome, a rare disorder that enables her to remember every moment of every day of her life. A twisting mystery, both chilling and surprising, And She Was sets the haunted investigator on the trail of a missing child who vanished more than a decade earlier—a case with disturbing echoes in Brenna’s own scrupulously remembered past. Discover what Harlan Coben, Lisa Gardener, Laura Lippman, and other masters of suspense and crime fiction have already learned: Alison Gaylin is one of the best! Alison Gaylin is currently considered a "single author." If one or more works are by a distinct, homonymous authors, go ahead and split the author. Alison Gaylin is composed of 2 names. You can examine and separate out names.